If you enjoy "Blessed Seller" religious fiction, grab a copy of our "Blessed Sellers Religious Biblical Fiction" box set series. A Miser. A Manger. A Miracle. 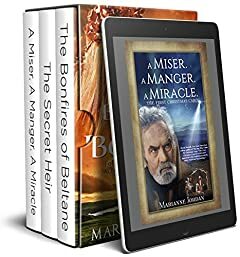 by Marianne Jordan â€” Darkness cloaks the hills of Bethlehem, but pales in comparison to the black heart of a greedy, unscrupulous innkeeper, who unknowingly sets into motion a night of miracles the world will never forget. The Bonfires of Beltane by Mark E. Fisher â€” Beyond the sea lies ancient, Celtic Ireland, a proud land where tradition is everything and travel through the wild can mean slavery or death. There the Roman evangelist, Saint Patrick, carries a message of love, hope, and salvation â€” a message that threatens kingdoms, rulers, and powerful druid advisors. The Secret Heir by Janice Broyles â€” One lives in a palace; the other sleeps under the stars. Though they come from vastly different worlds, Michal and David are drawn together. When King Saul uncovers David's secret and vows to kill him, Michal is torn between her love for her father and feelings for David. Two kings, two men she deeply loves but for different reasons â€” one heart broken in two.